We provide the perfect solution for most of the smaller plumbing jobs around your home or office. 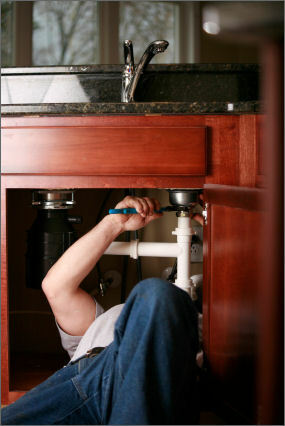 We tackle plumbing tasks taking between ½ an hour and a day. If you're not sure if we can help. Give us a call and ask us. Many customers use our services for labour only. However we're always happy to fit the parts you've already purchased. We carry with us essential plumbing materials and a selection of parts, so in most cases we can get on with the job without delay. You would save time and money by making sure that you have any unusual parts and materials before we arrive but we are happy to collect particular parts for you if required. We will add a small mark-up to items we supply using our expertise to select and find the correct parts & materials for you. Note: All parts supplied by us are charged extra to the task rate. Small companies, offices landlords and Homeowners use London Handyman Services to take care of their everyday maintenance and repairs. Please compile a list of small jobs and we will endeavour do them all in a single visit. Our handymen are not Gas Safe registered, You should use a Gas Safe registered specialist Plumber for complicated plumbing, gas work and Gas Certificates. We will supply Gas Safe registered plumbers when required. Dear London Handyman, I wish to commend your employee, Terry. For his professionalism and exceptional service. Terry has consistently shown impeccable workmanship on various projects throughout our home. It is a pleasure to have someone with such a positive energy and great attitude in our home during the installations. We were always confident that he would get the job done right and in a timely manner. His knowledge of the work is unsurpassed and handymen like Terry are not easy to find. We look forward to using your services in the future.